Prototype looks like Star Trek Emblem. Crazy! There are a few things I need to do with respect to supporting the boat. The first thing: I need to lift the boat off of its existing rack. This will let me remove the bar rack it rests on now so I can spin the whole boat. The second job is moving out one side of the structure a bit. Without removing the bar rack and moving the wall, the spin will not be possible. Lastly, I will need to reposition the boat in the center of the structure. This means moving the boat 6 inches to the right and possibly 6 inches towards the fore of the boat. 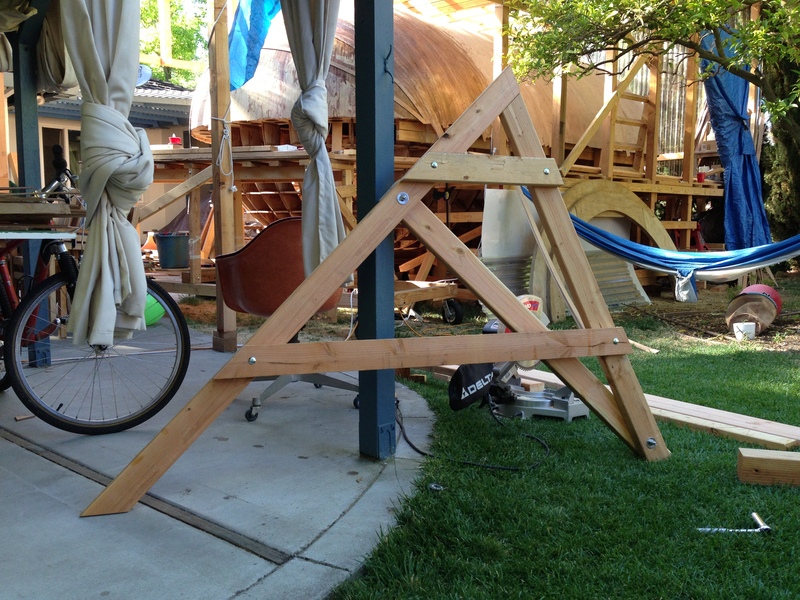 So… I am playing with designing a set of a-frames that will be placed on either side of the boat and linked together left and right as well as fore and aft. I need them to be strong, and I need to be able to set up the system under the boat without having to fuss with the existing scaffolding too much. Oh yeah, and the structure has to allow the bottle jacks to be placed underneath. Here is the first shot at it. Maybe too much? ← Finishing up the first diagonal layer!! !